I was contacted a few weeks ago by the awesome Sage, who wanted to know if I would be interested in taking part in a Blog Tour featuring Greenwoman Magazine. The name and description intrigued me. I'm only a fledgling gardener, but the daughter of an avid one, and an enjoyer of all things literary. This magazine sounded right up my alley. I'm so glad I said yes! This magazine is unique, and a true treat to read. Its fun, lush, vibrant, and sensual in a way that only plants and food and ground can be. Many people are familiar with the “one straw revolution” proposed by (the late) Japanese rice farmer Masanobu Fukuoka, but what about the simple, revolutionary powerhouse that is the seed? Seeds have often been referred to metaphorically when discussing revolutions, new movements, new beginnings, social change, and spiritual awakenings. It only makes sense that the first thing to emerge from a seed during germination is the embryonic root known as the radicle (pronounced “radical”). It has been said that it only takes one individual to start a revolution. It only takes one seed to start a forest. The process may be slow, but the potential is there. A tiny seed finds its way into a small crack in the sidewalk. The radicle emerges. Before you know it, a plant strong enough to push apart two concrete slabs has grown. A radical radicle pushes headlong through a pile of dirt and muck that has collected in a rain gutter on a rooftop. Up sprouts a renegade plant, adamant about making a human-made structure its home. Devastation can come in the form of a seed; ruins can be made of structures that were ignorantly thought of as eternal. Radicals rise up as radicles force themselves downward, rooting in new lives, and readying themselves for battle. Yes, the seed is revolutionary. Words are like seeds, and their influence can cause a social sea change as the message spreads. The Juniper zine is microscopic proof of that. The Juniper is my tiny eco-zine—a meager cut-n-paste publication printed on a copy machine and sent out around the world to interested folks—promoting the small, simple, slow life and encouraging the masses to grow it from seed and get here by bike. As letters have trickled in to the Juniper’s mailbox, this editor has noticed a thriving (albeit grassroots) social movement as readers have recounted their stories of gardening, biking, and going back to the land. Rusty bikes have been retrieved from dusty storage areas, tuned up, and taken for a ride. Derelict areas of backyard lawn have been turned over, and gardens have sprouted up. The slow life is spreading just as fast as the seeds can germinate, and off we sprint toward ecotopia. Spring is for sowing seeds and encouraging growth. Love is in the air, and heaven knows that the revolution needs much more of that. Cynicism can be brushed away for a while. Spring cleaning allows us to pull some of our skeletons out of their hiding spots and send them packing. It’s okay to feel overwhelmed while we’re at it. Certainly a seed recognizes the pressure that lies on its tiny self to thrive, flourish, and produce. But there is potential in all of us; potential that will not be compromised: neither blacked-out by black hearts nor whited-out by whitewash. The subversive seed and its radical roots will be our mascot. Let’s make our gardens grow. Let’s not rot in the soil, but instead sprout and rise up. Your neighborhood will be your seedbed. That’s where the movement starts. If you enjoy writing of any kind, and love the outdoors/gardening, then you definitely want to check out this read. I already have a few people on my list for gift subscriptions! Find Greenwoman Magazine on Facebook or on their website. Thank you so much for the beautiful review of Greenwoman. I really appreciate you taking the time to be a part of the blog tour! And I am very excited to tell Dan that you shared his essay! 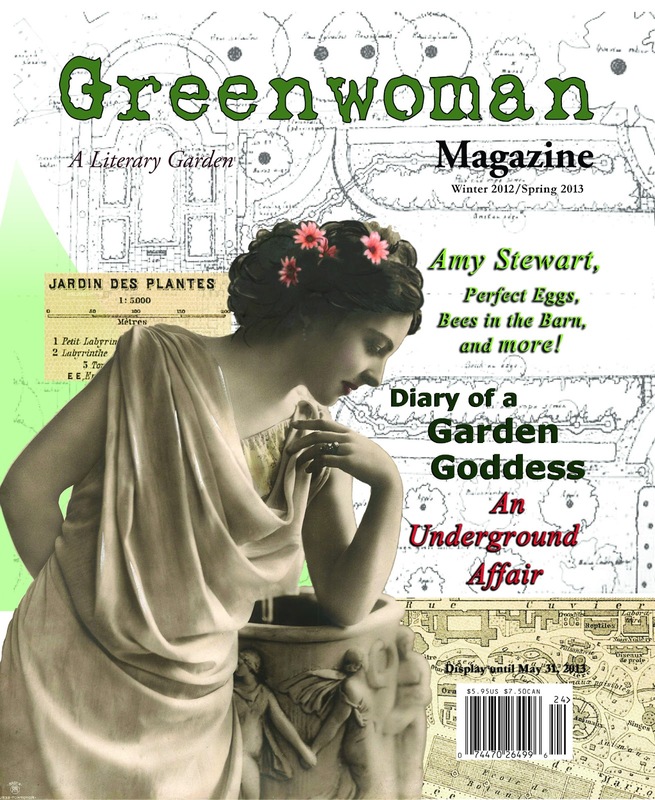 I would like to add that your readers can try a sample issue of Greenwoman (free PDF) by signing up for our mailing list at the website.